Produce your books in audio format and get them distributed by Audible.com, Amazon, and iTunes. The audio book market is set to ‘explode!’ Audio books are in the same position now that e-books were a few years ago. Why? Because millions of e-book readers have already been sold and all of them can play audio books. Right now the market is small, but look out! One of the downfalls of audio books has always been the lack of ‘players.’ Plus, they were expensive, bulky, and when you purchased an audio book it was shipped on a slew of tapes or CDs. It was a headache just trying to keep everything together. Portability was nearly impossible. NO MORE! Audio books can be downloaded over the Internet in minutes and stored in an e-book reader’s memory. This means instant gratification for the purchaser and a new income stream for the author! The stage is set for audio books to be the next-big-thing! Now is the time for every author to get a foothold in this emerging market. Once your book is FOR SALE on Amazon, Audible.com and iTunes, you’re in business! Everything is covered. You’ll learn where to buy a quality, yet inexpensive microphone and how to setup a ‘home’ studio for under $100. You’ll learn where to get ‘free’ audio editing software so you can produce your book like a ‘pro.’ You’ll learn recording techniques that will show you how to enhance your audio book with ‘free’ music and effects. Producing your audio book and getting it online is the main objective, but that’s only part of what you need to know. Opening a bank account, registering a domain name, setting up a website, designing your cover, and filing copyrights are covered as well. Every author should be asking themselves, “How can I be a part of this market when it takes off ?” This book answers that question and shows you how to do it! 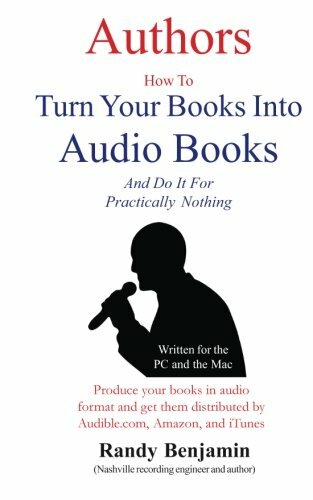 Written by an author who’s also a Nashville recording engineer, his years of experience will make the difference between just thinking about producing your audio book, and actually doing it!